The Lodge of St Michael 7833 enjoys music in the ceremonial and at the Festive Board. 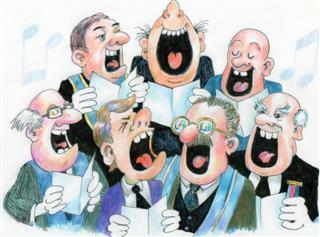 A number of the Brethren are accomplished singers: there is no shortage of volunteers to perform the Master’s Song and the Anthem at Installations. In the Lodge Room the Forster and Andrews organ (recently restored –see the History page) is used; downstairs a clavinova sits inconspicuously in the dining room. 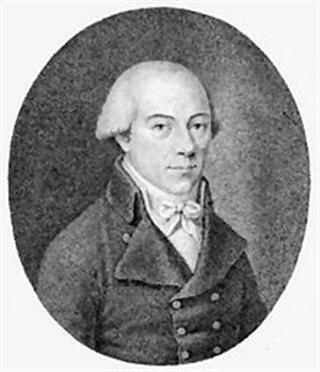 The Opening Ode Hail Eternal is to the tune Vienna, first published in 1799. It is by the Wittenburg musician Justin Heinrich Knecht. 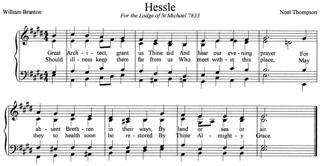 The Closing Ode is to the tune St Sylvester, by the Hull born Reverend John Bacchus Dykes, written 1862. At the Festive Board, musical “points” follow every toast, including the National Anthem. The toast to the Absent Brethren is followed by Great Architect, Grant Us Thine Aid, composed (both words and music) by founder members W. Bro William Branton and W. Bro. Noel Thompson (see the History page). When a Candidate is initiated, the Entered Apprentice Song is performed, the verses shared between the Brethren. At the end of the proceedings, all join in Auld Lang Syne.